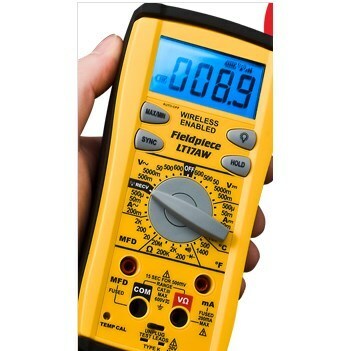 The LT17AW Digital Multimeter is loaded with the parameters and ranges HVACR professionals need for HVACR troubleshooting, plus it receives measurements wirelessly from any of the Fieldpiece Accessory Heads when connected to the wireless transmitter that's included. You can now easily measure current, resistance, voltage, capacitance, frequency, continuity, and temperature either directly, or wirelessly from up to 75 ft away. Because of the wireless capability you can connect your amp clamp and completely close the blower door so you get a more accurate amperage reading. Or you can set up a wet bulb measurement in the attic and get live readings while you're making adjustments at the condenser. Designed specifically for HVACR field service, the LT17AW combines wireless readings with specific features and benefits that HVACR field service pros need.